Yesterday after I went to pick up Wanda... (She's my new duck, more on her later this week!) I set out to get my dairy on. 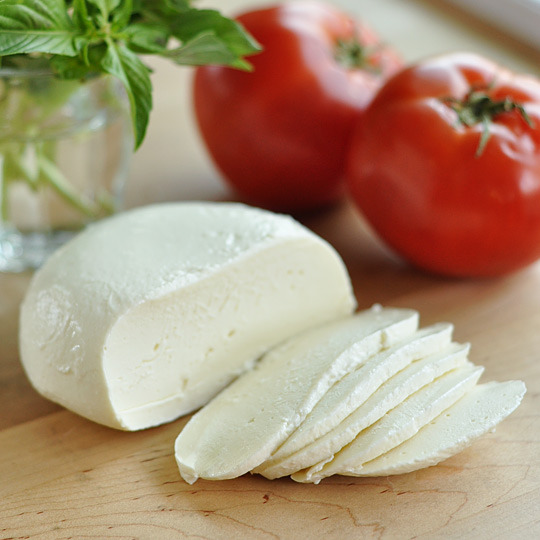 I have made a few cheeses in my life, but not mozzarella. So with a little extra milk I had this week, I knew exactly what I should do. Mozzarella looked challenging to me, but honestly this quick 30 min mozzarella is very satisfying and easy to do. During the process I took little snippet videos for an Instagram video. You can click on the picture below to view the video. Add 1/2 tsp liquid rennet into milk and stir continuously until mixture reaches 105*F. You need to continuously stir again because if you don't the hot milk will be on the bottom and the cold will remain on top. This way you won't overheat or scald the cheese. After the desired temperature is reached, pull off the heat, cover and rest for 15-20 minutes. Once rested, drain the curds from the whey. Cut or separate the cheese curds into 4 quarters, it makes it a bit easier to handle. Heat your whey up to 170*F.
Salt your cheese. I didn't measure here, and I didn't have cheese salt. I just dashed a little on each quarter of cheese. 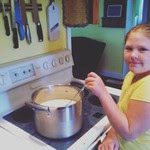 In separate bowl, place one portion of cheese and ladle hot whey over. This will begin melting the curds. You want to then start working the curds. Knead and pull... you want the cheese to get smooth and elastic. I ended up adding each quarter into the other after working to get smooth. That way I ended up with one ball of mozzarella.